CHICAGO (June 6, 2018) - The U.S. Soccer Development Academy conducted its 2017-18 Boys' Academy Playoff Draw on Wednesday, June 6, at Soccer House, U.S. Soccer's Chicago headquarters. With the qualified U-16/17 and U-18/19 teams drawn into eight groups of four teams each, the draw breakdown was posted on the Development Academy Twitter and Instagram feeds (@ussoccer_acad). Teams from across the country will now prepare for the Academy Playoffs and Quarterfinal Knockout Round from June 18-26 at the SoCal Sports Complex in Oceanside, Calif.
At the start of the draw, the top eight seeds (Pot 1) from each age division were drawn into Groups A through H, similar to the FIFA World Cup. Seeds 9-16, 17-24 and 25-32 (Pots 2, 3, 4) were then drawn to fill out each group, one pot at a time. If drawn with a divisional opponent, teams were placed back into their respective pot, resulting in a new selection, to keep same-division opponents separate in order to generate the highest level and variety of competition. The group stage of the 2018 Boys' Academy Playoffs marks the beginning point of the Academy postseason, featuring the top 32 teams from the U-16/17 and U-18/19 divisions based on the final standings of points per game average from regular season play. The Knockout Round, Quarterfinals follows from June 25-26, when the eight group winners will stay in Oceanside and vie for one of four spots in the Academy Semifinals, set to kickoff at Swope Soccer Village in Kansas City, Mo. on Sunday, July 8 with the championship games to be played on July 10. 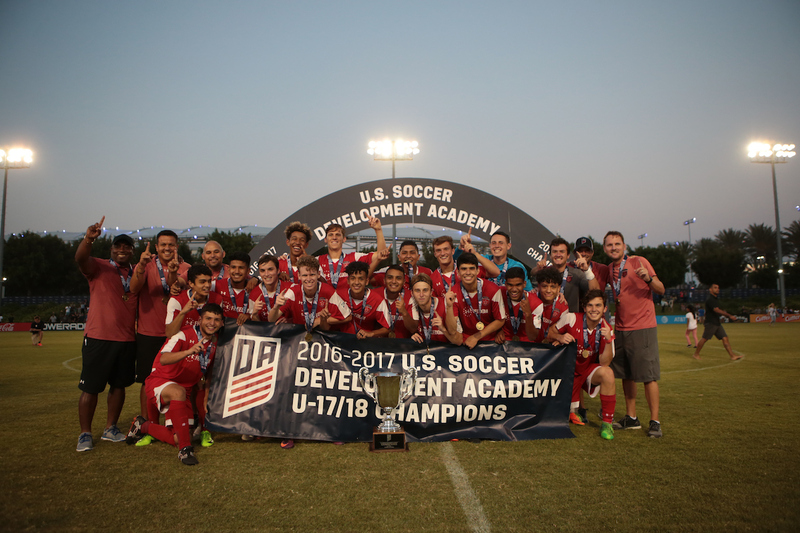 The 2018 Boys' Development Academy Champions will add their name to the prestigious list of past academy champions. The Group Stage will be played in conjunction with the 2018 Summer Showcase, where all 81 U-15 Academy clubs and the remaining 45 U-16/17 teams, which did not crack the top 32 playoff spots, will play three Showcase games. The Summer Showcase provides Academy teams meaningful games against a variety of competition from throughout the country. The event focuses on player, coach and referee development and also serves as a premier opportunity for talent identification. The 2018 Development Academy Summer Showcase and Playoffs will also include competition formats from all four age groups of the Girls' Academy, which is completing its inaugural season of programming. In total, between Boys' and Girls', the Summer Showcase and Playoffs will feature 634 games at SoCal Sports Complex from June 18-30, and the Development Academy will emphasize the quality of clubs and players with select Feature Games streamed live on ussoccerda.com and U.S. Soccer YouTube and U.S. Soccer Facebook. To be announced at a later date, the feature game matchups will be selected based competitive games and clubs that exemplify the Academy philosophy. Of 38 clubs to qualify for Boys' postseason play, 26 Academy programs made the Playoffs for both age groups. This marks a record high for the number of programs to qualify for both age group tournaments, following the 23 double qualifiers in 2017. In 2017, M.L.S. side Atlanta United FC became the first Development Academy program to a title in its inaugural season in the program since the Academy's first champions were crowned in 2008. Not only will the club look to repeat at the U-16/17 age group, but the 5 Stripes will also look to make a splash at the U-18/19 age group. Atlanta finished with the 9th overall seed at the older age group and 5th at U-16/17. Atlanta's U-16/17 squad will need to get past Real Salt Lake (who they defeated in the semifinals in 2017), BW Gottschee and Vardar if they want a shot at back-to-back titles, while the clubs' U-18/19 team faces Montreal Impact FC, Houston Dynamo and LA Galaxy in the only all-MLS group from the U-18/19 Academy Playoffs Draw. This marks the second time in the history of the Academy that an all-MLS group was drawn across either age group. Not only did both New York Red Bulls and New York City FC qualify at both playoff age groups, the rival clubs were also matched up directly at the U-16/17 age group. With the last day of group stage play featuring the group #1 seeds facing the #2 seeds, June 23 is bound to be circled! Red Bulls U-18/19's earned the #1 overall seed and will need to get past Crew SC Academy, Sporting Kansas City and Kendall SC if they want a shot at getting to Kansas City. After missing the playoffs at both age groups in 2017, San Diego-based clubs Nomads SC (U-18/19) and San Diego Surf (U-16/17) will look to take advantage of the minimal travel so they can rest up and make a few upsets happen. In what makes for a particularly uncommon pairing, non-M.L.S. clubs Sockers FC, Weston FC and Oakwood Soccer club not only went against the odds to become double qualifiers, the three clubs were also paired together in U-16/17's Group B, along with Baltimore Armour, and in the U-18/19's Group C, accompanied by Seattle Sounders FC. On day six of the 2018 Summer Showcase and Playoffs, U-16/17 sides Philadelphia Union and Vancouver Whitecaps will square off in Oceanside. That same day, on June 23, the Union and Whitecaps first teams will battle it out at Talen Energy Stadium in a non-conference regular season M.L.S. showdown. With a total of 55 games played to decide the champions of both age groups, all 32 participating clubs will look to etch their name on the prestigious Academy trophy. At the U-16/17 level, past champions include Carmel United, Derby County Wolves, Chicago Fire, LA Galaxy, New York Red Bulls, Real Salt Lake AZ, FC Dallas and Atlanta United FC. Both LA Galaxy and FC Dallas will be looking to raise their third cups. At the U-18/19 age group, past champions include Baltimore Bays, Carmel United, Vardar, Pateadores, FC Dallas, New York Red Bulls, PDA, Chicago Fire and Texans SC Houston.